Paul was named "Saul" (mighty) likely at his Hebrew circumscision at 8 years old, and "Paul" when he entered Apostolic ministry (Act 13:9). As Paul increased in spiritual power he decreased in his own eyes (i.e., he calls himself Paul). The Colosians letter was carried with Philemon (Col 4:17, Phi 2:25). One of the greatest thing that can mentioned about us is that we "refresh" others (Phm 1:7). For Philemon and Onesimus, Paul is the mediator — a picture of Jesus Christ. 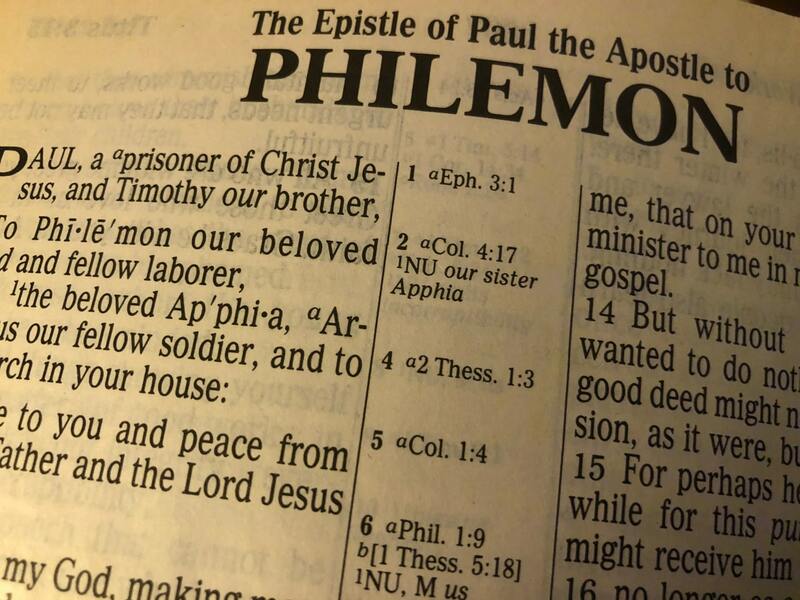 Philemon exhibited genuine love, active faith (Gal 5:6), a productive fellowship (known for his giving), refreshment, and joy and comfort. Paul prayed for Philemon (Phm 1:4). Jesus stressed persistence in prayer (Luk 11:5-9). When we pray is not always when God will answer the prayer; He may have to prepare us for the gift. Philemon had every right to put Onesimus to death having stolen and escaped. Paul thanks Philemon for his love and faith toward the Lord and saints (Phm 1:5, Gal 5:6, 1Jo 3:10). "That the fellowship of your faith may become effective" (Phm 1:6, 1Th 4:1, 1Th 4:10). Paul is saying that whatever you've accomplished still abound more. Press on. Excell still more (Phi 3:14). Be content with what you have, but never be content with who you are. Decisions are wise or foolish depending on a humble or arrogant attitude. Genuine humilty is always Christ centered. If you sow character, you reap destiny. We are a product of our decisions, though environment has an effect. Humility begins with effective prayer; it comes from God and is the product of learning while interacting with God. From Series: "Philemon - A Living Parable of God's Redemption - California 2011"
In Philemon 10-11 Paul writes 'I appeal to you for my son Onesimus whom I have begotten while in my chains who once was unprofitable to you but now is profitable to you and to me.' These verses highlight the theme of the letter namely redemption and reconciliation. The annual Weekend Bible Conference was held 5-7 August 2011 in Orange County California.